Back in September, my mother came across this children’s book and decided to give it to my mother-in-law as a gift. 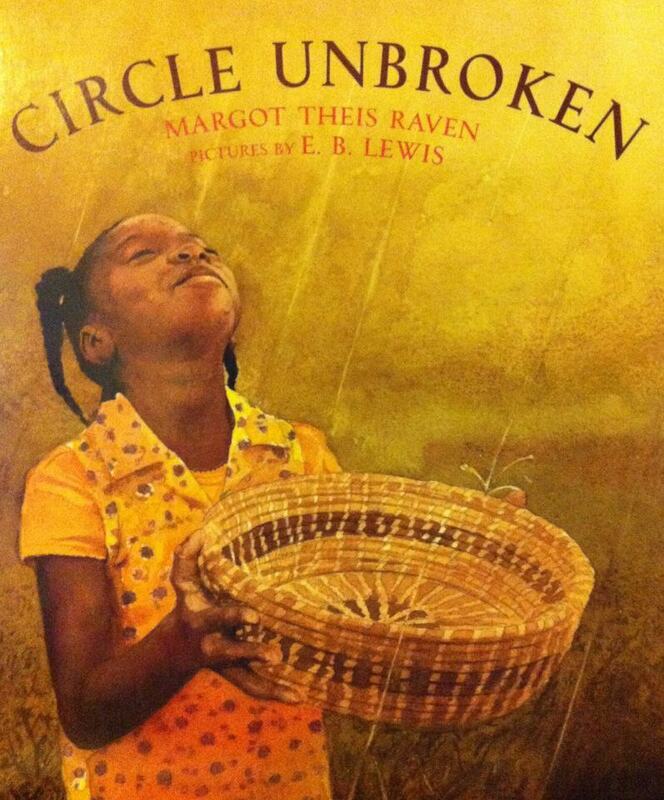 Circle Unbroken, by Margot Theis Raven, is a story told by a grandmother to her granddaughter about how she learned to weave the sweetgrass baskets of South Carolina’s Lowcountry. What unfolds on its pages, exquisitely illustrated in watercolor by E.B. Lewis, is not just the story of a basket, but of how that basket holds the history of a people: it’s the story of “old-timey grandfather” and “old-timey grandmother,” who learned to make baskets “across a wide, deep ocean, in faraway Africa” and how their tradition was passed down from generation to generation through slavery and liberation, through sharecropping and war, through economic boom and tourism — through fear and hope. Every “chapter” ends with an inspiring refrain: “And when his fingers talked just right, his basket held the rain, and he remembered from where he came.” In its poetry and simplicity, Circle Unbroken is a remarkable celebration of the perseverance of an African culture, transplanted, adapted, and preserved against all odds in a foreign land. It might seem like an odd choice of gift for a white woman from South Carolina to give to her white French son-in-law’s mother, but it’s not really. Last Christmas, my mother had given my mother-in-law a sweetgrass basket woven by one of these very women who had learned the craft from her mother … who had learned it from her mother … who had learned it from hers. It isn’t my mother’s art or her tradition, but it is a symbol of the struggle, the hope, and the resilience of a people whose story is intertwined with hers in the same South Carolina soil. And now that the translation is finished and Michel has helped me polish it, my mother-in-law can share this story in her own language with her grandchildren, and they can honor together the threads of family, tradition, and history that are woven “in and out — around and through” her sweetgrass basket. Circle Unbroken is available in many bookstores, as well as online. What a lovely thing for your mother to do, and how nice for you to be able to contribute to a beautiful cross cultural understanding of an important story.